Millions of people have gazed upwards and seen her face. Armed with a sword, shield, and avenging eagle, her scene represents War. As a manifestation of Freedom, she stands victorious over her enemies. The adherents of tyranny and kingly power located at her feet flee from her sight. Located just below the saintly figure of George Washington, she is one of the most iconic parts of the masterpiece that covers the interior of the U.S. Capitol Dome. 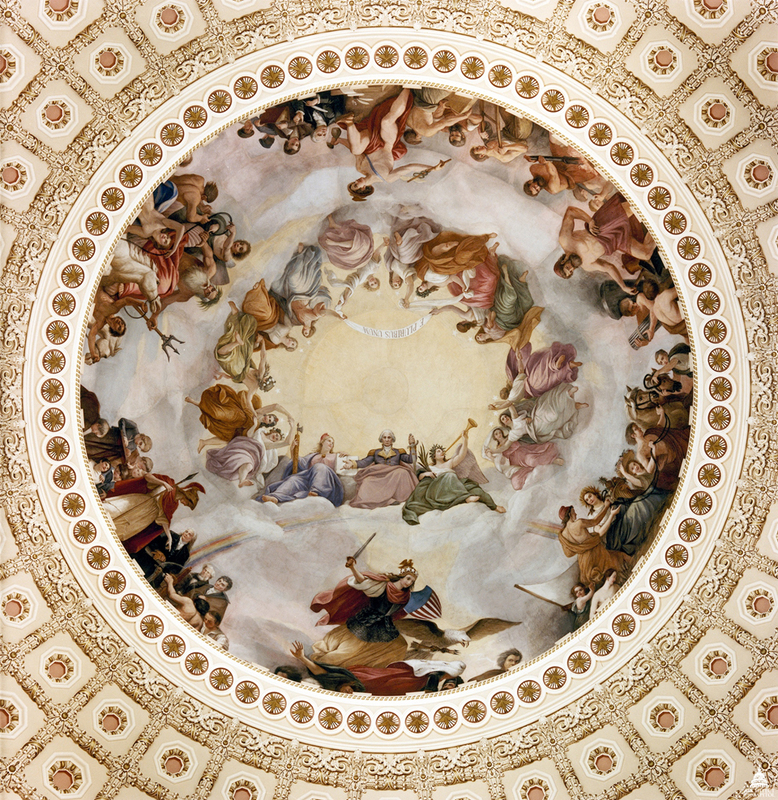 Unknown to many, the figure of Freedom represented in the dome’s The Apotheosis of Washington is based on a real woman. Her name was Lola and this is her story. Lola’s looks were a family trait that also happened to be shared by a cousin of hers named Effie Germon. Effie used her looks to find success as an actress and was likewise complimented as having, “a fair young face, strikingly beautiful.” Though Effie Germon found her looks to be an asset that helped her achieve success, for Lola, her beauty would forever prove to be a double-edged sword. As a young girl growing up in D.C., Lola, then called Jennie, was surrounded by unique urban types. According to later accounts, at one point Mrs. Germon decided to open up her house to boarders in order to help support her family. One of the gentlemen who allegedly found residence in the Germon household was an Italian artist named Constantino Brumidi. Brumidi was born in Rome on July 26, 1805 and had learned the art of fresco painting. He had done work in the Vatican Palace and even painted Pope Pius IX after his ascendance to the papacy. After political unrest swept through Rome and Brumidi spent time in prison under false charges, he decided to immigrate to America to continue his artist work. Brumidi arrived in America on September 18, 1852. He spent two years making a living doing portraits and frescos in private residences and churches throughout the northeast. He even traveled down to Mexico to complete an altar for a Catholic church. Brumidi arrived in Washington, D.C. in December of 1854 and arranged to meet Captain Montgomery C. Meigs, the engineer in charge of construction and decorations on the extensions being done to the U.S. Capitol building. Through Meigs, Brumidi was hired to be the Capitol’s chief artist and he would spend over 25 years painting the Capitol. The story goes that Constantino first met Jennie in 1858 when she was between 13 and 15 years old. As she developed, Brumidi came to see Germon as his muse. She was said to have possessed, “all the perfecting features of beauty which poets choose to accord their heroines of that race, and, in addition, was grandly tall and as faultless in physique as a sculptor’s ideal.” Brumidi is said to have become enraptured with Jennie Germon’s beauty. In time, the 56 year-old Brumidi began living with young Jennie separately from Mrs. Germon. A sexual relationship developed between the two though Jennie’s age precluded it from truly being an equal, consensual situation. Despite the relationship that the two would share in the years to come, it’s clear that Brumidi was one of the first to take advantage of the reluctantly beautiful Jennie. On May 12, 1861, Jennie Germon, who was between 16 and 18 years-old, gave birth to Brumidi’s son. The child was named Laurence Stauro Brumidi. Evidence points to the idea that Jennie Germon appears to have left Brumidi not long after the birth of their son. It seems probable that Jennie sought to escape the relationship that had resulted in her pregnancy. In either late 1861 or early 1862, Jennie found employment in the Treasury Department as one of the first female clerks assigned to help with the process of cutting and sorting the government’s new paper money. The Treasury Department was one of the first government agencies to hire female employees and sought to hire only girls and women who demonstrated a true need for employment to help provide for their families. While such an arrangement helped women who were in otherwise dire financial situations, like Jennie Germon, it also created an environment where the clerks were powerless to stand up to the predatory attacks from their male superiors. Sadly, Jennie left one abusive relationship and was forced into another while at the Treasury department. It appears that Jennie Germon’s beauty once again made her a target as she was one of the women preyed upon by Spencer Clark, the first superintendent of the U.S. Bureau of Engraving and Printing (for context, it may be helpful to read the prior post about Clark). When an investigation regarding the rumors of sexual misconduct on the part of Treasury department superiors occurred, Jennie Germon revealed that she was coerced into sexual situations several times by Spencer Clark in exchange for money which she used to support herself and her young son. Jennie’s full statement, which she hoped would not be given publicity and yet was later released by the investigator, Lafayette Baker, can be read here. Jennie escaped the abuse she suffered at the Treasury the only way she knew how, by getting married. On September 21, 1863, Jennie married a man named Francis A. Clover. After departing the Treasury, the new Mrs. Clover also chose to retake her given name of Lola rather than her childhood nickname of Jennie. It appears that during Lola’s marriage to Clover she allowed Constantino Brumidi visiting rights to his son, Laurence. This re-introduction of the artist may have put a strain on her marriage, or perhaps Lola’s marriage to Clover had only been out of convenience sake. Regardless, Lola’s first marriage failed after only a year. On October 25, 1864, Lola was granted a divorce from Clover. The exact details of what occurred over the next few years is not known for certain. What can be concluded is that Brumidi and the now about 20 year-old Lola reconnected and began living together once again. In later years, Lola would claim that the two were actually married in Baltimore during this time, but no official record of marriage between the two can be found. Later evidence also appears to cast doubt on the idea that Lola and Brumidi ever married. 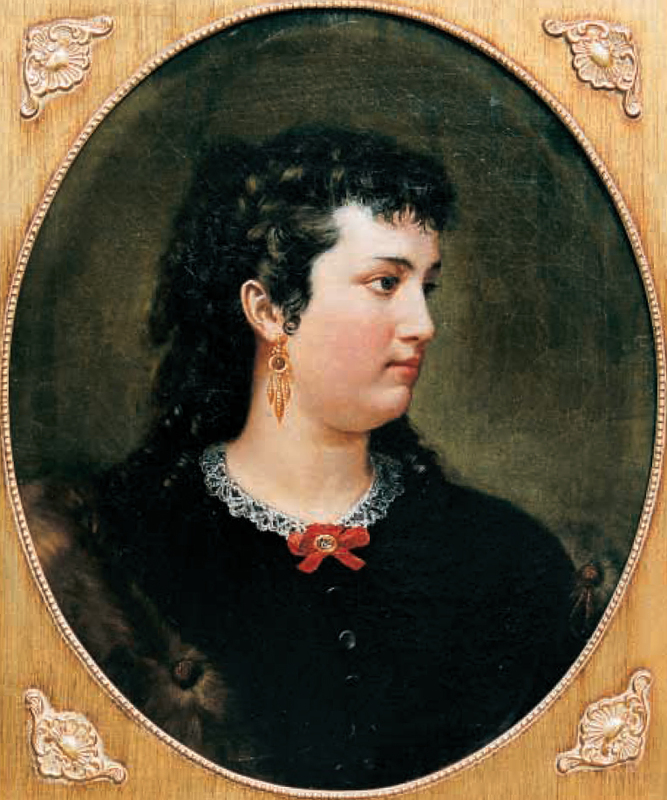 It was between this period of time though, from 1864 – 1870, that Lola began calling herself Mrs. Brumidi. It was also during this time that Brumidi began incorporating Lola’s likeness into many of his frescos at the U.S. Capitol. The most well-known of Brumidi’s works is the aforementioned The Apotheosis of Washington which adorns the interior of the dome of the Capitol building. 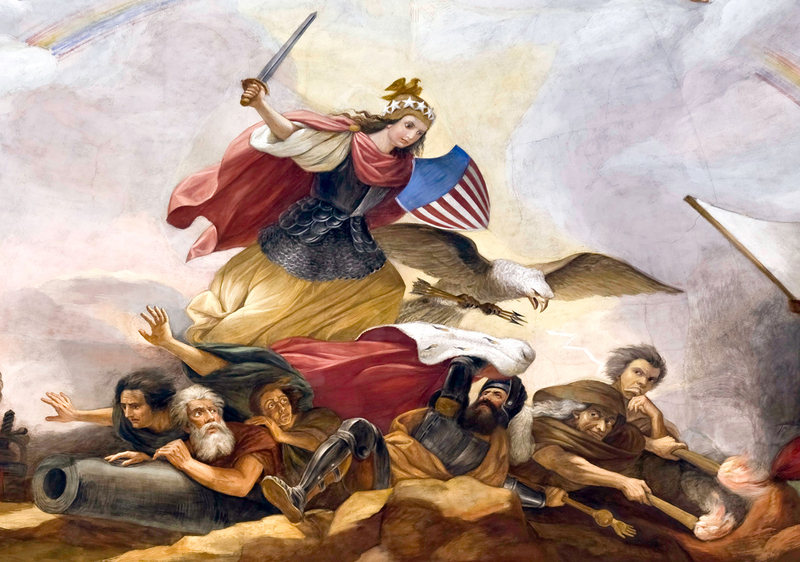 Brumidi modeled the figure of Freedom in the War scene exclusively on Lola. Lola was not the only one from whom Brumidi drew inspiration. The figure of Liberty who is seated at the right hand of George Washington was modeled after Lola’s similarly beautiful cousin, the actress Effie Germon. 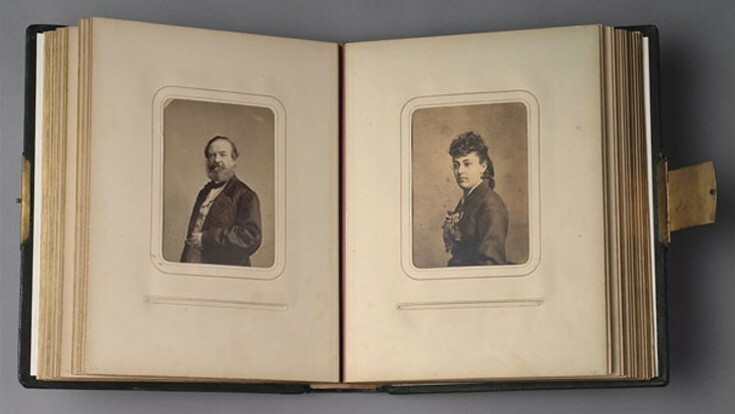 When John Wilkes Booth was cornered and killed after assassinating President Lincoln, Effie Germon’s carte-de-visite was one the photographs found on his body. Brumidi also used a few well-known models for the figures of tyranny and kingly power which Lola’s figure of Freedom is shown vanquishing. Specifically, he chose to use the likenesses of the recently defeated leaders of the Confederacy as his traitorous models. While Brumidi was known to have continued his work on the Capitol between 1864 – 1870, he also took prolonged breaks in work for outside commissions. The U.S. government was not always timely in its payment for Brumidi’s services and so he would often take out-of-town commissions to maintain his finances. At the end of 1866, for example, Brumidi spent a few months painting in Cuba. Aside from absences such as these, however, Lola, Brumidi, and their young son, Laurence, all lived together in D.C. This second relationship between Lola and Brumidi did not last however. While we do not know the circumstances, on May 23, 1870, Lola married a man named Joseph Walsh, Jr. in Alexandria, VA. The circumstances of how they met or reliable background information on Mr. Walsh is not known. The few facts that can be gained from this marriage is that Walsh was fairly affluent and that Lola began residing outside of Washington with her new husband. She, Walsh and Laurence began splitting their time between D.C. and Brooklyn, New York. In 1873, 12 year-old Laurence was enrolled in the first grade at the Brooklyn Collegiate and Polytechnic Institute. Coincidentally, or perhaps purposefully, Constantino Brumidi took a number of commissions that brought him to New York during Lola’s residence there. Brumidi was known to be working at churches and sites in New York for periods of time in 1870, 1871 and 1873. It seems likely that Brumidi would visit his muse and his son during these commissions. In yet another sad experience for Lola, she would come to learn that her new husband Walsh was not the man she thought he was. In 1875, Lola, then residing back in D.C. petitioned for a divorce against Walsh. Newspaper accounts stated that Lola, “charges her husband with various acts of unfaithfulness.” In particular, Lola alleged that she had reliable evidence that her husband was known to frequent a brothel while they were residing in Washington. 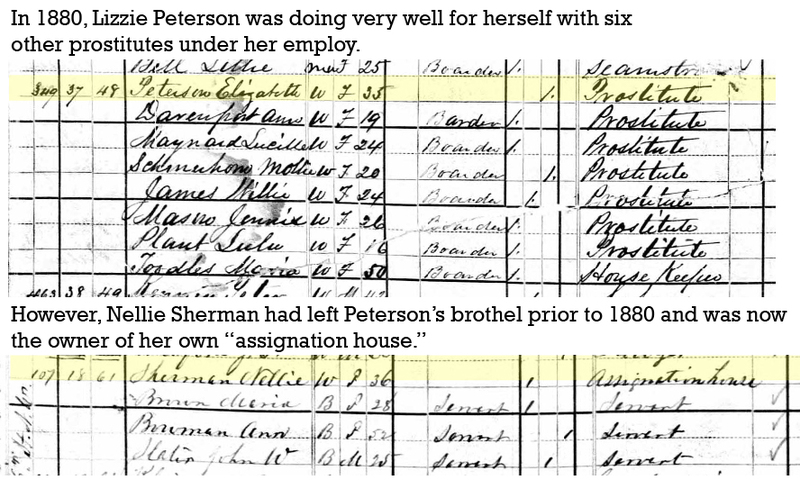 She even went so far as to name the specific brothel (Lizzie Peterson’s) and prostitute (Nellie Sherman) that her husband visited. On June 10, 1876, Lola was granted a divorce from Joseph Walsh on the grounds of desertion. 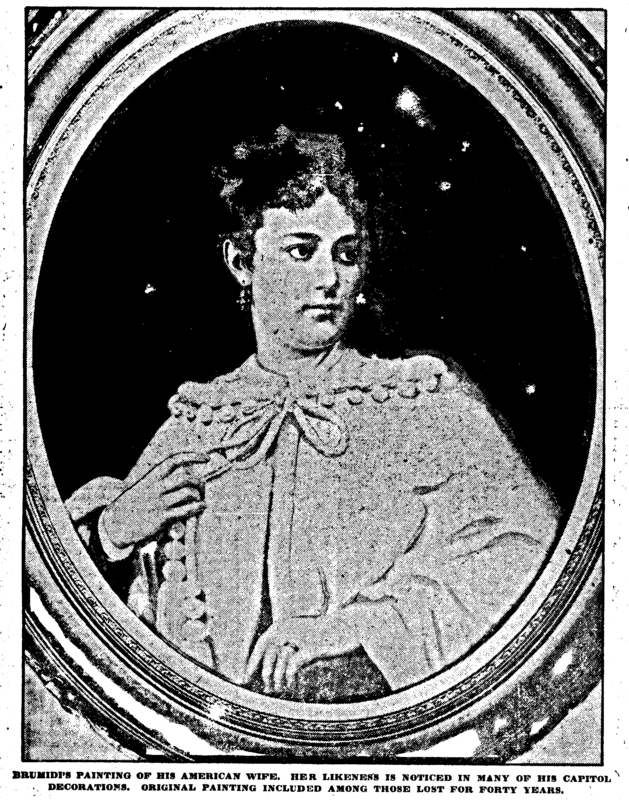 Divorced for the second time (third if you include the possibility of a legitimate marriage to Brumidi), 31 year-old Lola Germon Clover [Burmidi] Walsh, took up residence on the 900 block of G St. NW. This is place where Lola would call home for the next 20 years. In time, Brumidi was granted an elevator system which was merely just a box in which the artist would sit which was then hoisted up to his scaffold via a pulley on the ceiling. Young and strong Laurence Brumidi was no doubt one of the assistants who helped hoist his father to his massive canvas. In addition to providing his father strength, Laurence also got the benefit of learning from a master and he quickly started to pick up his father’s artistic eye. Lola observed all of this closely. Though her motivations are unclear, by 1878, Lola had allowed Brumidi to move into the home that she and Laurence shared on G street. Perhaps she was taking pity on the artist and sought to help care for him and his infirmities. Perhaps she hoped Brumidi’s close residence would further support her son’s education. Or perhaps, for some inexplicably reason, Lola actually had feelings for the man who had taken advantage of her when she was little more than a child. If Constantino Brumidi’s art is to be taken as evidence, it does appear that he did love Lola, at least in some fashion. It was likely a selfish love, one that Brumidi took in order to further his talents, but he did have a connection to Lola. What deep feelings and conflicts Lola had for Brumidi is not known. However, her conduct in the years after his death show her to be very protective of him and his legacy despite all of the trouble he had caused her. Though the two were now living together once again, they did not marry (or perhaps remarry). Lola was still documented in the city directory as Lola Walsh during this time. On February 19, 1880, at 6:30 am, Constantino Brumidi died at the age of 75. Newspapers reported that his death was a combination of asthma and kidney failure. When the end was coming, Laurence had sent for a doctor but none arrived in time. While we do not have a record of Lola’s whereabouts when Brumidi died, it seems likely that she was there with him. Obituaries for the artist of the Capitol were published throughout the country. Many lamented that while Brumidi had completed many beautiful works of art from the Apotheosis of Washington to the Brumidi Corridors in the Senate wing, the large frescos he was working on at the time of his death in the inner ring of the dome were still incomplete. The call went out for an artist to finish the job. Though Laurence Brumidi applied to complete his father’s work, he was judged too inexperienced to be tasked with such a project. As compensation though, the government chose to pay Laurence $1,500 for the sketches his father had made for the remaining unpainted frescos and used them as the template to complete the project. In addition, out of appreciation for Brumidi’s years of work, the government also decided to gift Laurence, and his half-sister from the artist’s first marriage in Italy, with $250 each for the services their father had provided and had not yet been paid for. The government also included an extra $200 gift payable to “Brumidi’s heirs” to help offset the cost of the artist’s funeral and burial. While her name is not mentioned directly in the bill which provided the funds, it was Lola who took charge of Brumidi’s body upon his death. Lola buried him in Glenwood Cemetery, in the very same plot that held her own parents, the Germons. Despite the money received by the government, it does not appear that Lola put up a gravestone for Brumidi at the time of his death. Whether the funds actually went towards his burial, or use in her son’s education, we don’t know. What we do know is that Lola did not let her son give up on his dreams. She sent him to the National Academy of Rome in the 1880’s to learn all he could. When he returned from abroad he moved out to Kansas City, Missouri for a time where he helped establish and served as the first director of the Kansas City Art Institute. Throughout the 1880s and 90s, Lola maintained her home on G street in Washington. To make money, she opened up her few rooms to boarders and settled into the life of a boardinghouse keeper. It was also during this time that Lola stopped referring to herself as Lola Walsh and instead portrayed herself as Lola Brumidi, once again. Most people considered her to have been Brumidi’s legitimate widow even though they were definitely not married at the time of his death and probably had never been married in the first place. Lola maintained the name of Lola Brumidi for about 20 years, until she found herself changing it once again. In 1900, 55 year-old Lola decided to marry again. Her husband was a 59 year-old widower by the name of Edwin Kirkwood. This marriage, unlike Lola’s other attempts, appears to have been a happy one, or at least, not one that ended with a divorce. While some men might have been intimidated to marry a woman whose personal history was so involved and dramatic, it was actually Lola who was taking a risk. Edwin Kirkwood was a convicted felon. Edwin Columbus Kirkwood was born in Maryland in 1841 and had served in the Union army for one year during the Civil War before moving to D.C. He married his first wife, Alice, in 1862 and the two started a family. After a couple years, Kirkwood found employment as a clerk in the Navy’s Bureau of Medicine and Surgery where he would eventually rise through the ranks and become a lead financial clerk. Then in June of 1884, a reckoning came for Edwin Kirkwood when he was arrested and charged with fraud. It appears that during a period of time lasting from 1876 – 1884, Kirkwood and Daniel Carrigan, the chief clerk at the Bureau of Medicine and Surgery, repeatedly embezzled money from the government by way of fraudulent claims for reimbursement. After rumors of fraud came to the bureau’s knowledge, the then Surgeon General of the Navy asked the first chief of the Secret Service, William Wood, to investigate. Wood had previously been in charge of the Old Capitol Prison where many of those involved in the Lincoln assassination were held in 1865. Wood found evidence to support the idea that Kirkwood and Carrigan had brought in many third parties who would pose as business owners looking to receive payment for services and materials rendered to the bureau. The two clerks would create fraudulent claims containing lists and prices of materials and the third parties would present these claims to the treasury for reimbursement. Once the third parties received the money, they would split the funds with Kirkwood and Carrigan. The clerks’ long history with the bureau allowed them to get many fraudulent claims signed off by the different Surgeon Generals of the Navy. Most often, the clerks would place the fraudulent claims between the duplicates of legitimate claims. The Surgeon General of the Navy would consult the first claim on top, verify it was genuine and that the materials had been supplied, and then sign it and the duplicate copies underneath without reading them. After the fraudulent claims had been cashed, Kirkwood would then adjust the financial books to hide the payouts. Through this scheme, the two clerks and their revolving group of “businessmen” successfully defrauded the government of over $44,000. In March of 1884, sensing that the game may have been found out, Daniel Carrigan resigned from the bureau and went west to the Dakotas. Kirkwood, however, stayed in D.C. and was still working at the bureau when he was arrested. His initial bail bond money was put up by a friend of his named James Pumphrey. Pumphrey was the owner of a stable and, in 1865, it was from Pumphrey’s stable that John Wilkes Booth had rented the horse he used to escape Washington, D.C. after shooting the President. As the bond amount increased with each additional case against the former bureau clerk, Pumphrey eventually stopped paying Kirkwood’s bond. For the next few months, Kirkwood was tried alongside various co-conspirators and Carrigan, in absentia. On March 7, 1885, Edwin Kirkwood was sentenced to 6 years in Albany Penitentiary for one instance of false claims with a third party businessman named Bill Mann. Though several more businessmen like Mann were brought to trial for their part in receiving monies from false claims, the government decided not to prosecute Kirkwood in these additional cases. Had they chose to pursue Kirkwood in each separate case of his fraud, his combined punishment could have been around 80 years in prison. Shortly after Kirkwood’s sentence of 6 years, Carrigan returned from the west and surrendered himself. He entered in a plea bargain confessing to four instances of fraud rather than being tried for all of the cases against him. Like Kirkwood, Carrigan was given a 6 year prison sentence. While at his initial trial Kirkwood claimed that he acted under the orders of Carrigan and did not know the claims he was helping to compose were fraudulent, Kirkwood later made a full confession of his crimes while in prison. Despite attempts by his lawyer to have him imprisoned in D.C., Kirkwood was sent up to Albany where he was put at hard labor. He was released early for good behavior and returned to D.C. on March 14, 1889. During his time in prison, Kirkwood’s wife, Alice, died. His eldest son, Horace, took guardianship over his little sister and entered into the restaurant business. When Kirkwood returned home he decided to follow his son’s lead. Kirkwood purchased a property on the Rockville Turnpike leading out of Georgetown called The Willows. It served as a bar and restaurant. To avoid notoriety, Kirkwood operated the tavern under the name of Columbus Kirkwood, his middle name. It’s possible that Lola Brumidi met Kirkwood at his establishment. At around the time Lola and Kirkwood met, Edwin’s son and daughter had moved to Richmond. After their wedding in 1900, Edwin moved his new wife down there as well. For the next few years, Edwin Kirkwood would work as a manager in his son’s restaurants and then as a grocer. In the 1910 census, Lola Kirkwood is shown living in Richmond with Edwin and her son, Laurence Brumidi. 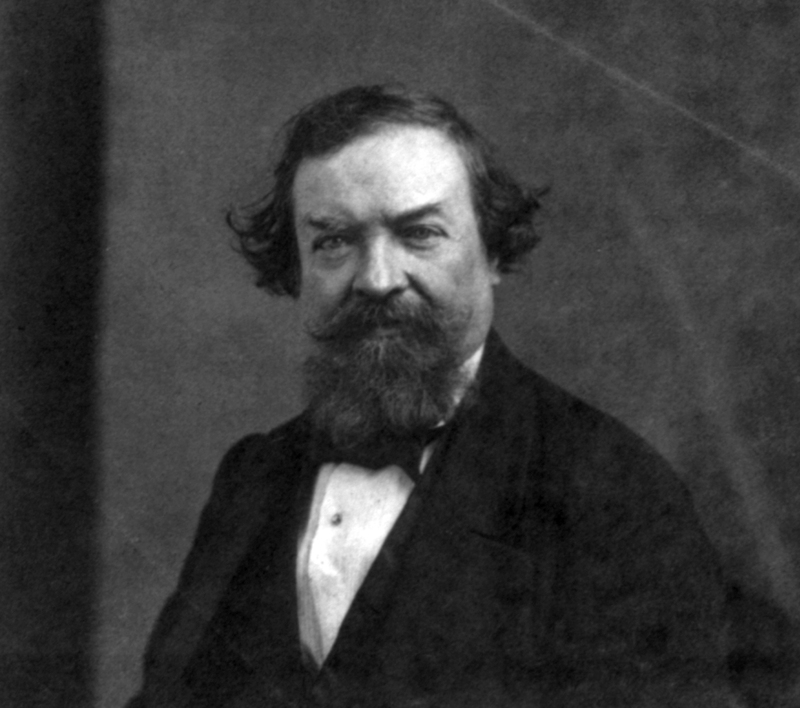 After leaving Kansas City, Laurence Brumidi had traveled to Paris where he continued his studies and exhibited his work. Then he returned to the States where he focused not on frescoes, as was his father’s forte, but on landscape and portrait paintings. While he found some success as an artist, he never gained the fame of his father. Laurence was also troubled. He suffered from bouts of severe depression which impacted his art and his social life. It is likely he was living with his mother and stepfather in Richmond in 1910 for the emotional comfort they could provide him. Still, depression and mental illness were not fully understood or accepted in those days. At some point after 1913, Edwin, Lola, and Laurence moved back to D.C. By 1916, Lola was so worried about her 55 year-old son’s well-being that she took the only option available at that time. On June 22, 1916, Laurence Brumidi was judged to be of unsound mind stemming from severe depression and he was committed to St. Elizabeth’s Insane Asylum. He would reside there for the rest of his life. In 1918, Lola Kirkwood was about 73 years-old and in failing health. On April 2nd of that year she completed and signed what would prove to be her last will and testament. In that will, Lola instructed that upon her death all of her estate was to be transferred into the creation of a trust. The purpose of the trust was to provide for the “board and maintenance of my beloved son Lawrence [sic] S Brumidi during the term of his natural life.” The executor of Lola’s will and the one who was to oversee the trust was a successful real estate broker named Edward P. Schwartz. Having made arrangements for her son’s future, Lola added her signature to the will. 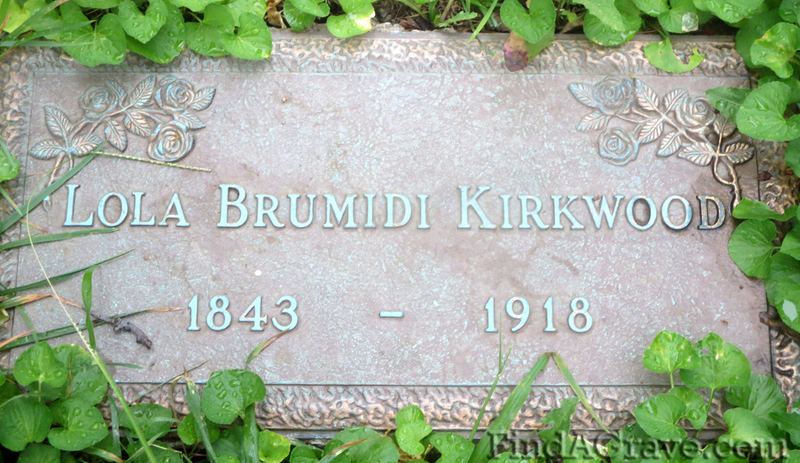 Less than six months later, Lola Virginia Germon Clover [Brumidi] Walsh Kirkwood passed away. Her death occurred on September 26, 1918 at the home she shared with her final husband, Edwin. Lola was interred at D.C.’s Glenwood Cemetery in the same family plot where she had buried Constantino Brumidi 38 years earlier. After the loss of his wife, Edwin Columbus Kirkwood was not long for this world. He died less than a month later on October 14, 1918. He was interred in the Germon family plot as well. After the death of Lola Kirkwood, Edward Schwartz began the process of setting up a trust for her son Laurence. He began taking account of all of Lola’s possessions. Per his accounting he found that, at her death, Lola had over $10,000 in bank notes, cash, and possessions. She also owned a piece of property in Washington valued at $2,750 that was being leased at a rent of $25.50 per month. This made Lola a fairly wealthy woman when she died. In addition to the above named assets, Edward Schwartz also began a search for a group of paintings and sketches that had been done by Constantino Brumidi. Schwartz would later state that Lola had informed him that a collection of her “husband’s” work were in storage somewhere but she did not know where. Upon her death and the creation of the trust for her son, Schwartz searched high and low for this collection, scouring old warehouses in the city. After almost a year of searching, Schwartz had found nothing. It appears that around 1889, nine years after Constantino’s death, Laurence Brumidi put two large boxes into storage at the National Savings and Trust Company. Schwartz, by sheer luck, had stumbled upon their hiding place. He subsequently sought permission from the courts to pay the storage fees, retrieve the boxes, and open them. Schwartz invited a few prominent Washingtonians to witness the opening of the boxes including representatives from the Library of Congress, the National Gallery of Art, and the art custodian of the Capitol building. At least 27 paintings were rediscovered in those storage boxes that day, including Brumidi’s model for The Apotheosis of Washington. Also included in the cache, however, were two paintings of a more personal nature. The above quoted Evening Star article on the discovery ran two full pages, with one of Lola’s paintings taking up a large portion of a page. With the lost paintings found, Schwartz started the process of taking and accounting them for Lola’s estate. In less than a month, however, Schwartz found himself faced with legal challenges. It appears that during the interim between Lola’s death and the discovery of the paintings, Schwartz had made at least one enemy while going about his work as executor and director of Laurence’s trust. In trying to get a reckoning of Lola’s possessions, Schwartz made the surprising discovery that Lola was never named as an heir in Constantino Burmidi’s will. In fact, upon Constantino’s death in 1880, he left everything, all of his possessions, to his son, Laurence. Schwartz discovered that he was in an awkward position of being in charge of a trust for Laurence’s benefit based on Lola’s estate, but that some of the possessions that Lola had considered to be in her estate had always belonged solely to Laurence. This meant that there were assets out there that were technically Laurence’s that Schwartz had no control over, including the lost paintings. To rectify this, Schwartz petitioned the government to effectively make him Laurence’s guardian and gain control over all of his assets, not just Lola’s trust. This was granted by the courts and, at that point, Schwartz sought out items and possessions he believed belonged to Laurence. One object Schwartz sought to recover was a diamond ring that was valued at around $1,000. Schwartz was under the impression that the ring had been owned by Constantino before it came into Lola’s possession. During Lola’s last years, she had given the ring to her niece, Elizabeth Thompson. Schwartz approached Thompson and informed her that she had to surrender the ring. Thompson balked at this and stated that it had been a present from Lola. 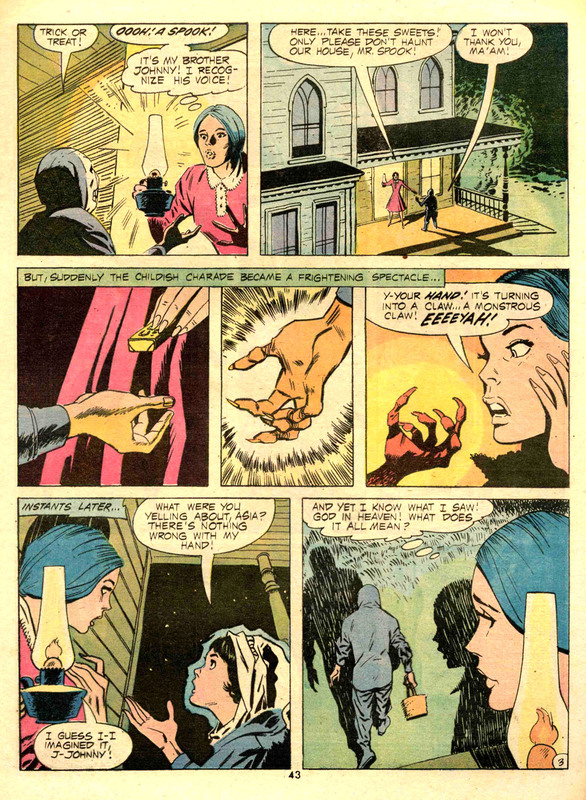 Schwartz responded that, since Laurence was Constantino’s only heir, the ring had never actually belonged to Lola and she was not authorized to give it away. As Laurence’s custodian, Schwartz demanded the ring’s return. Rather than giving in, Elizabeth Thompson hired a lawyer. Thompson’s lawyer, a man named E. Hilton Jackson, then worked through legal means to have Schwartz removed as Laurence’s custodian. This endeavor to remove Schwartz was still underway when Schwartz discovered the Brumidi paintings. 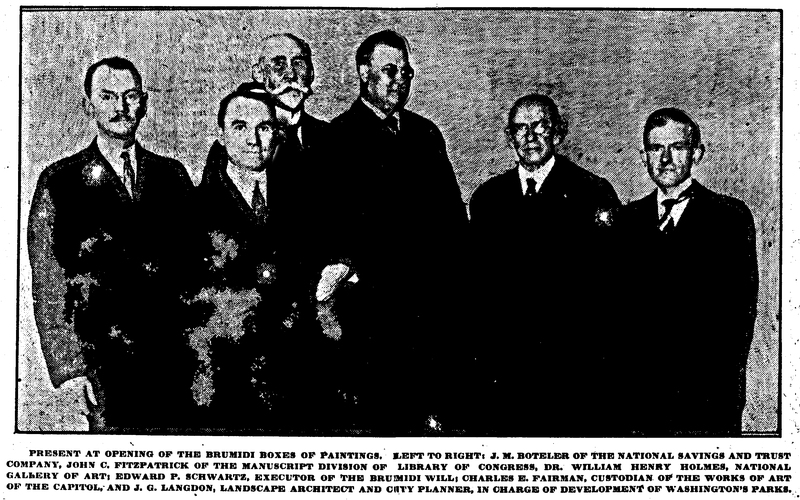 After the discovery of the paintings became news, several other relatives of Lola’s came forward and joined Elizabeth Thompson’s petition to remove Schwartz as custodian. It is likely that the value of the paintings motivated some of Laurence’s cousins to suddenly become so interested in their lunatic relative’s estate. Despite the legal challenges against him, however, the courts ruled that Edward Schwartz was acting within his court appointed fiduciary duties and that the petitioners did not have adequate evidence to have him dismissed. 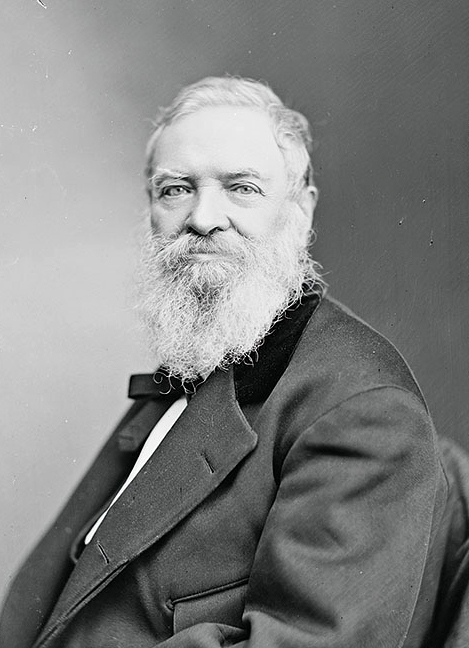 E. Hilton Jackson appealed the ruling of the D.C. court without success. 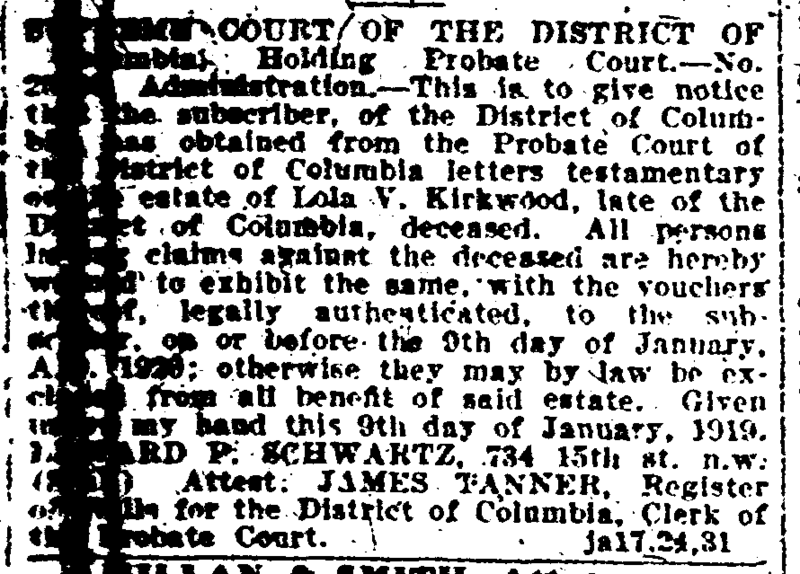 On November 8, 1920, the case was decided conclusively in favor of Schwartz. The very next day, November 9, 1920, Laurence Stauro Brumidi died at St. Elizabeth’s Asylum. He was 59 years-old. In the obituary that appeared in Washington papers, Laurence was spoken of kindly as a talented portrait painter who assisted his father in his great work. Schwartz, as his custodian, had Laurence buried next to his mother and father in Glenwood Cemetery. With Laurence now dead, Schwartz’s role now changed. In Lola’s will she had made it clear that, upon the death of her son, the remaining balance of her estate was to be split among five of her nieces and nephews, including Elizabeth Thompson. Despite the legal challenges Thompson had made for him, Schwartz was now compelled to work on her behalf. In addition, since Laurence never married or had any heirs of his own, it was decided that his estate would be split about his cousins. To facilitate this, Elizabeth Thompson’s lawyer, E. Hilton Jackson, was brought in to act as the cousins’ representative. Though it took some time, things went relatively smoothly from there. The family divided up some of Lola and Laurence’s personal possessions including a family photo album. The heirs also chose to retain some of Brumidi’s sketches for the Capitol dome friezes. This photo album and the sketches were later donated to the Capitol. The very valuable paintings that Schwartz had discovered, however, were to be sold at auction and the proceeds split equally among the heirs. The auction of Brumidi’s paintings occurred on May 7, 1924 by care of C. G. Sloan and Company. A total of 27 of Brumidi’s paintings were auctioned off including his oil painting model of The Apotheosis of Washington. That specific painting would stay in private hands for the next 88 years. In March of 2012, the miniature version of the dome fresco was auctioned off by Skinner. A bit of a bidding war ensued for the piece, but, in the end, the winning bid came from the Smithsonian American Art Museum. The Smithsonian paid a whopping $539,500 for the model of Brumidi’s most famous painting. 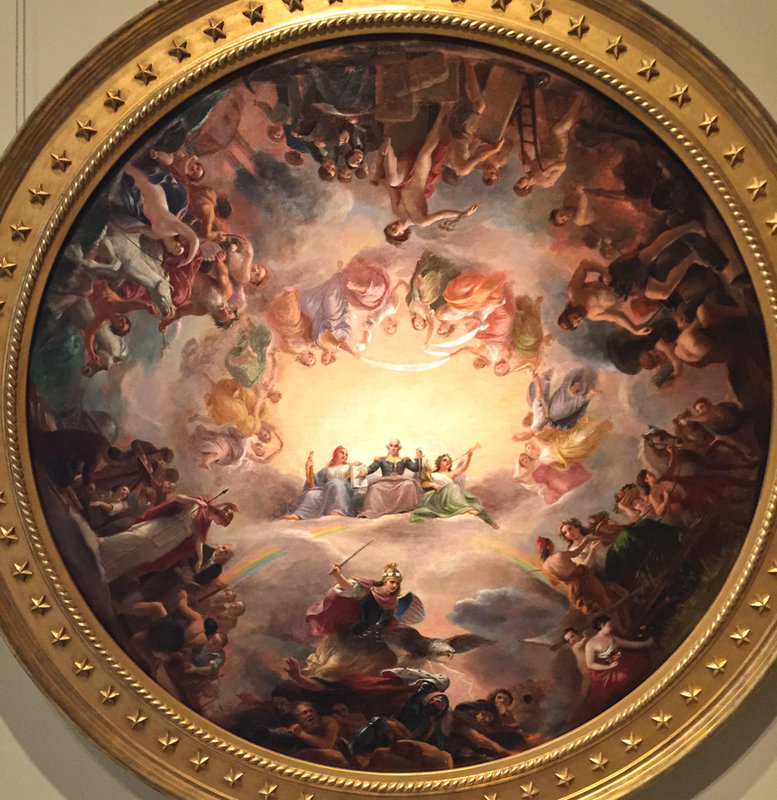 Oil painting of The Apotheosis of Washington by Constantino Brumidi on display at the Smithsonian American Art Museum. In a strange twist of fate, the graves of Constantino, Lola and Laurence Brumidi remained unmarked in Glenwood Cemetery for many years. While the U.S. government had provided Lola and Laurence with $200 to help offset the funeral costs for Constantino in 1880, it does not appear that either used these funds, or any subsequent funds, to pay for a headstone. Lola and Edwin died within a month of each other and Laurence was not considered sane enough to handle his own matters so their graves also remained unmarked. For a long period, the only gravestones in the family plot were those of Lola’s parents, Vincent and Eliza Germon. 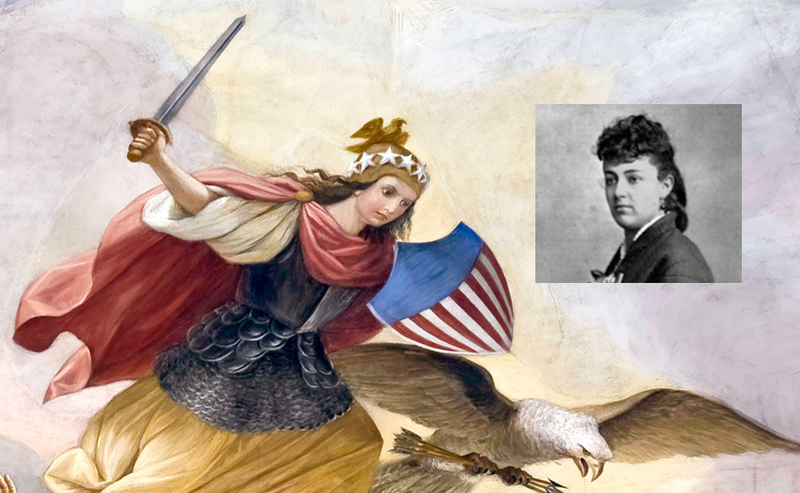 Thanks to a persistent woman who had some sway in Congress, however, all that changed. Myrtle Cheney Murdock was the wife of Arizona representative John R. Murdock. Rep. Murdock was first elected to Congress in 1937 and served until 1953. During the Murdocks’ time in Washington, Mrs. Murdock became enamored with the artistry in the Capitol building. She sought to learn more about the man who had designed and painted so many beautiful works of art. What started as mere curiosity became a passion and soon Mrs. Murdock was looking for everything she could about Brumidi. In time, she had enough material on Brumidi to write a book on the artist. 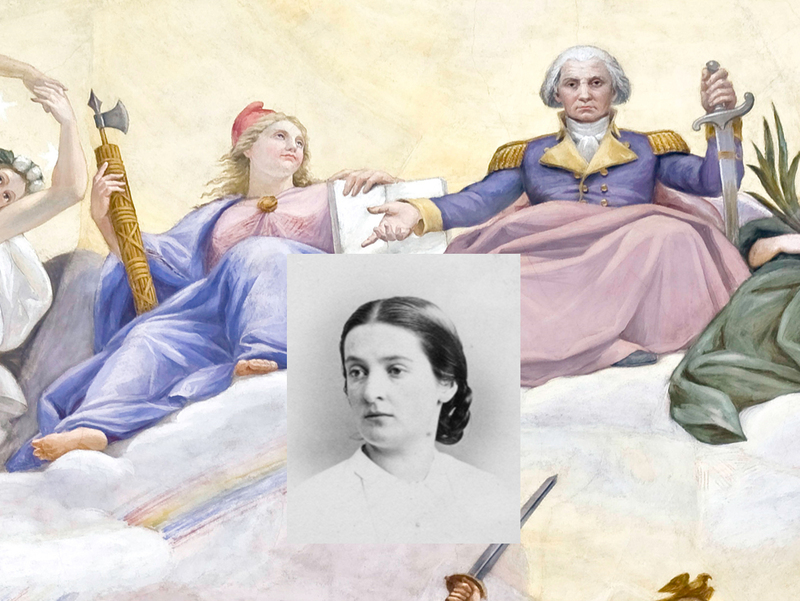 When she learned that the great artist of the Capitol was buried unmarked in Glenwood Cemetery, she persuaded her husband to petition Congress to help pay for a memorial on Brumidi’s grave. She persisted and in July of 1950, President Truman signed a bill allocated $500 for the erection of a bronze marker on Brumidi’s grave and the perpetual care of it. 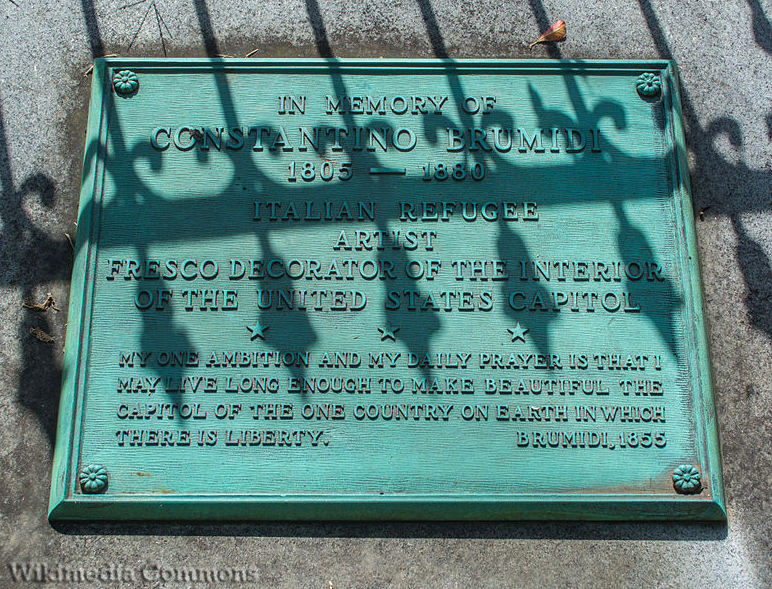 In February of 1952, the new grave marker for Constantino Brumidi was dedicated. 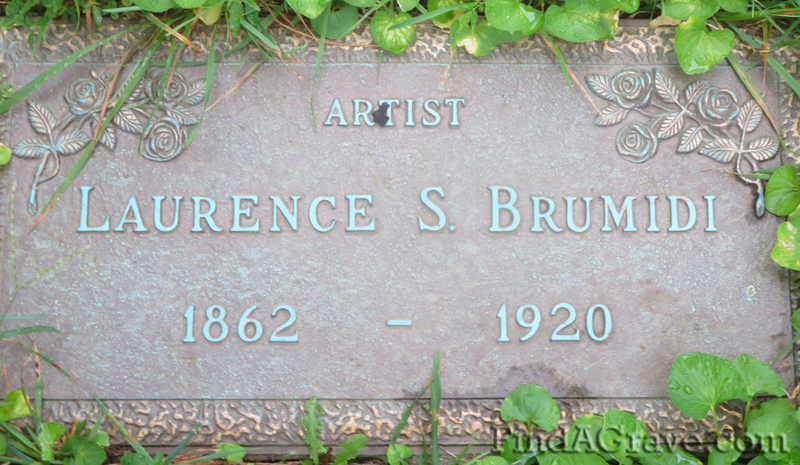 At some point following 1952, someone, possibly Mrs. Murdock or other admirers of Brumidi, commissioned to place markers on the graves of Lola and Laurence as well. Lola now sleeps flanked by her son and the artist she inspired. Her final husband, Edwin Kirkwood is still unmarked, sharing the same grave site as his wife. In more recent years, the reputation of Constantino Brumidi has continued to grow. In 1998, Dr. Barbara Wolanin, Curator for the Architect of the Capitol, published an impeccably researched biography of Brumidi and his work. Her book, Constantino Brumidi – Artist of the Capitol, brought Brumidi’s life and accomplishments to a new generation. In 2008, President Bush signed legislation posthumously awarding Brumidi a Congressional Gold Medal. The medal was released in 2012 and bears a portrait of Brumidi on the obverse while the reverse contains the center ring of his Apotheosis of Washington. The story of Constantino Brumidi will, undoubtedly, continue to be told. And so we return once more to the intended subject of this biographical sketch, Lola Germon. Due to a shortage of documentation regarding her own words and thoughts, it has been regrettably necessary to tell Lola’s story largely through the lens of the relationships she had with men, both famous and infamous. Lola was known for her beauty and her beauty helped to inspire many great works of art. However, she was more than just a pretty face. Lola Germon faced an immense amount of abuse and adversity during her lifetime. She struggled to raise a child, briefly witnessed the success of her emotionally draining labors to that end, and then had to endure his gradual mental decline. She was the muse to a great artist whose pieces have stood the tests of time, but he clearly took away pieces of her in the process. She suffered through too many marriages of unhappiness and unfaithfulness. Through it all, however, Lola Germon survived. Like the figure that bears her likeness in The Apotheosis of Washington, Lola never stopped vanquishing her foes. She never gave in or surrendered to the tyranny that sought to crush her. Instead, she continued to raise her sword high and fight for a better life for herself and her son despite the personal toll. That is the story of Freedom. That is the story of Lola. Biographical facts about Lola and the others were painstakingly put together by utilizing the census records, marriage records, divorce records, city directories, and wills available on Ancestry.com. This material was supplemented with newspaper articles found via GenealogyBank.com, Newspapers.com, and the Library of Congress – Chronicling America. Further details of Constantino Brumidi’s life and art come from Dr. Barbara Wolanin’s book, Constantino Brumidi – Artist of the Capitol. Several of the images in this post also come from that book. Additional facts about Laurence Brumidi’s life were discovered by using Wolanin’s book and the legal records regarding his insanity and estate cases. The details of Edwin Kirkwood’s crime and punishment were pieced together by consulting the plethora of newspaper records covering his trial and its aftermath. John Wilkes Booth’s Crimson Claw! Our friend and fellow Lincoln assassination researcher, Scott Schroeder, was a recent guest on a podcast that discusses comic books of the horror genre. 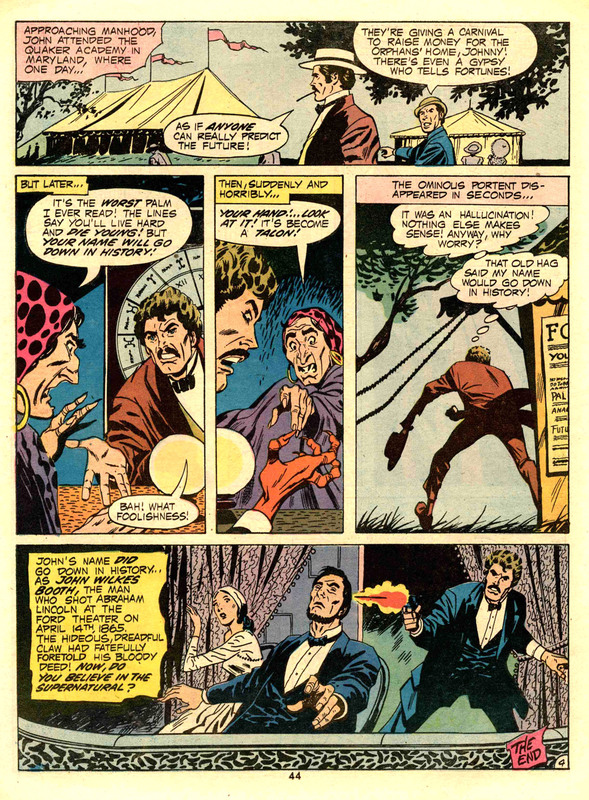 The subject of Scott’s appearance on Midnight The Podcasting Hour stems from his own interest in depictions of Abraham Lincoln and his assassination in comic books. On the podcast, Scott shared one of the many unique stories he had found that centers around Lincoln and his assassination. 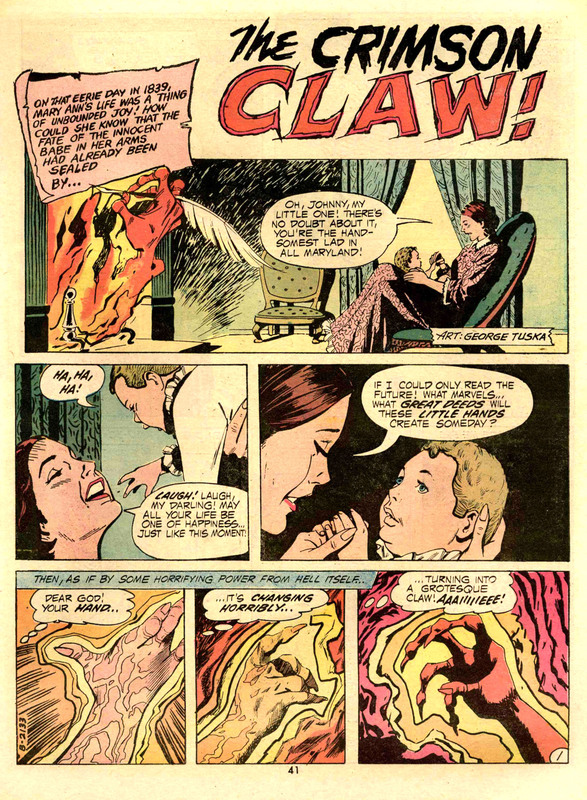 Specifically, Scott highlighted a story from a 1972 issue of the analogy Ghosts entitled The Crimson Claw! In the podcast, Scott leads a fascinating discussion with the host regarding the almost unbelievable facts behind this work of artistic fiction. The entire podcast is 51 minutes long but Scott doesn’t really start in until the 5:30 mark and his segment ends at 39:30. You can listen to the podcast by clicking here to stream it, or by clicking here to download it. Scott Schroeder will be speaking more on the topic of the Lincoln assassination in comic books at this year’s annual Surratt Society Conference on April 1, 2017. The conference is put on by the Surratt House Museum and takes place at the Colony South Hotel and Conference Center in Clinton, Maryland. Scott’s speech topic perfectly fits my description of the event as Boothie Comic-Con. The conference is a wonderful way to learn more about the Lincoln assassination and meet others who share an interest in the history. Please visit the Surratt House Museum website for information on how to register. Both Kate and I will be joining Scott as presenters at this year’s conference, so I hope you’ll be able join us. I want to thank Scott for his kind references to BoothieBarn and Roger Norton’s Lincoln Discussion Symposium during the podcast. 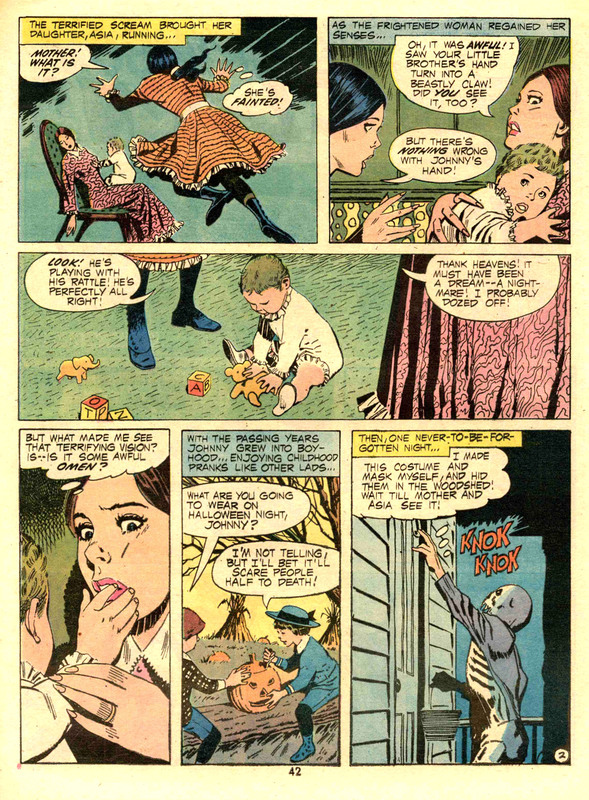 To tide you all over until Scott’s speech in April, here is a far inferior post I put up a few years ago about some of the other depictions of The Lincoln Assassination in Comic Books. Yesterday, I posted about about Carl Bersch and his painting, Lincoln Borne by Loving Hands on the Fatal Night of April 14, 1865. 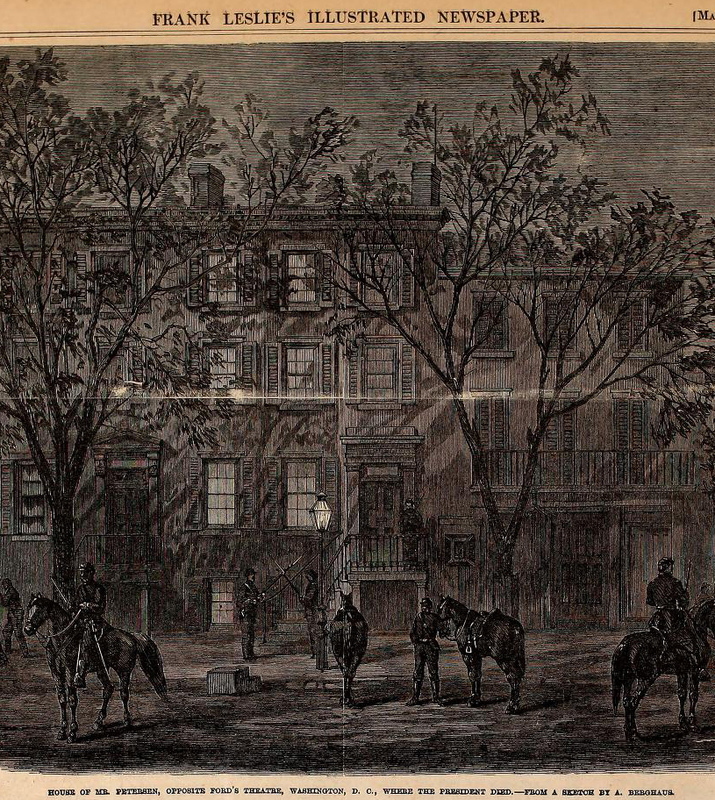 At the time of Lincoln’s assassination, Bersch was living across the street from Ford’s Theatre and made sketches of the chaotic scene after the assassination. He used those sketches to paint this eyewitness image of the event. While working on that post I came across another painting that shares the same subject matter. In 1872, artist Howard Hill painted his own version of the wounded President being carried across Tenth Street. His painting is called, Assassination of Lincoln, and it is currently owned by the Albany Institute of History and Art. Howard Hill was not present in D.C. on the night of Lincoln’s assassination and therefore his painting is not based on eyewitness sketches like Carl Bersch’s painting. Still it is clear that Hill did his research and when composing this piece. Hill’s painting includes the detailed figure of not only the wounded Abraham Lincoln but also shows grief-stricken Mary Todd Lincoln. They are both followed by the figures of Henry Rathbone and Clara Harris, the Lincolns’ guests at Ford’s Theatre that night. 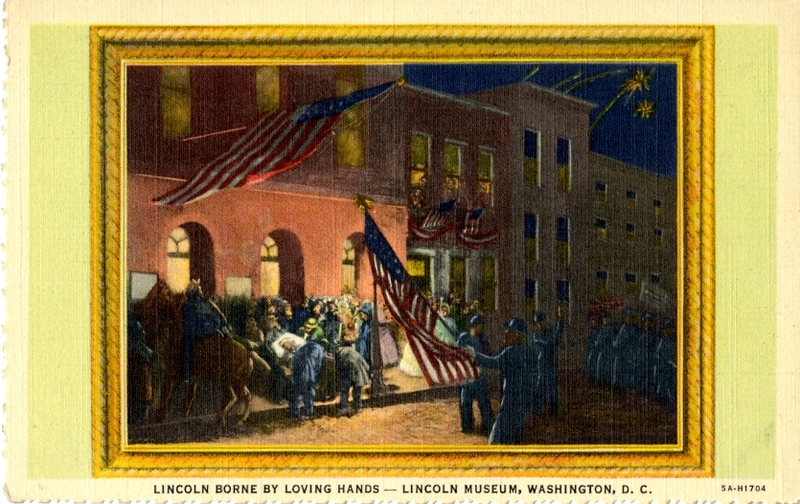 While both Bersch’s painting and Hill’s painting show Lincoln being carried across the street to the Petersen boardinghouse where he would later die, the biggest differences between them are the secondary scenes they contain. 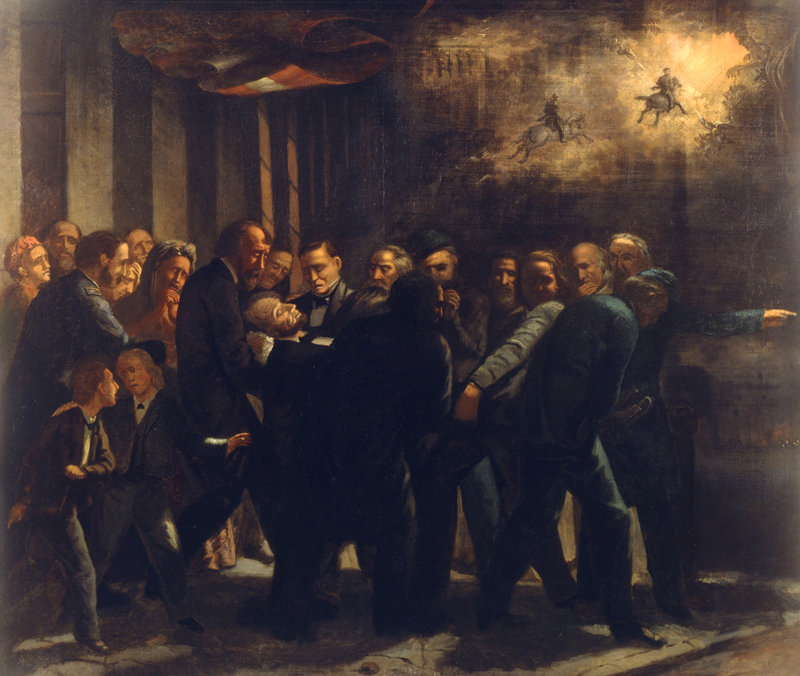 In the darker corner of Bersch’s painting (which will hopefully be more visible in the restored painting) there is a small scene of celebration marking the end of the Civil War. In his letter home, Bersch mentions that his first sketches on April 14th captured the parades and jubilation that were occurring below his balcony. Bersch still used these sketches when completing his final painting and combined two these contrasting images, one of celebration and one of sorrow, into the single painting. Lincoln Borne by Loving Hands is not centered on Lincoln but on the American flag, which continues to fly over everything, good and bad. Hill’s painting, on the other hand, does seem to center more on the figure of Lincoln and the men carrying him. But our eyes are also drawn to the top right corner of the painting where a different scene is playing out. Hill depicts the horseback figures of David Herold and John Wilkes Booth fleeing from the tragic scene. Booth is riding away when he seems to look back at his handiwork. As he does this a legion of demons reach out to him as he effectively rides into their grasp and into hell. David Herold follows Booth’s course, but his attention is drawn to a premonition of the gallows that he will face for his crime. Strangely this gallows shows the execution of five people rather than the four that actually occurred. Perhaps one of the bodies is meant to symbolize Booth’s death as well. Howard Hill’s Assassination of Lincoln shares a similar theme with Carl Bersch’s Lincoln Borne by Loving Hands but the compositions differ in their focus and details. The inclusion of the celebratory revelers and the focus on the American flag in Bersch’s painting evokes the prospect of hope in our darkest times, while Hill’s visions of doom for the assassins emphasizes the importance of justice. Taken together, these two paintings demonstrate the complex feelings that emerged after Lincoln’s assassination. Howard Hill was born in England in 1830. 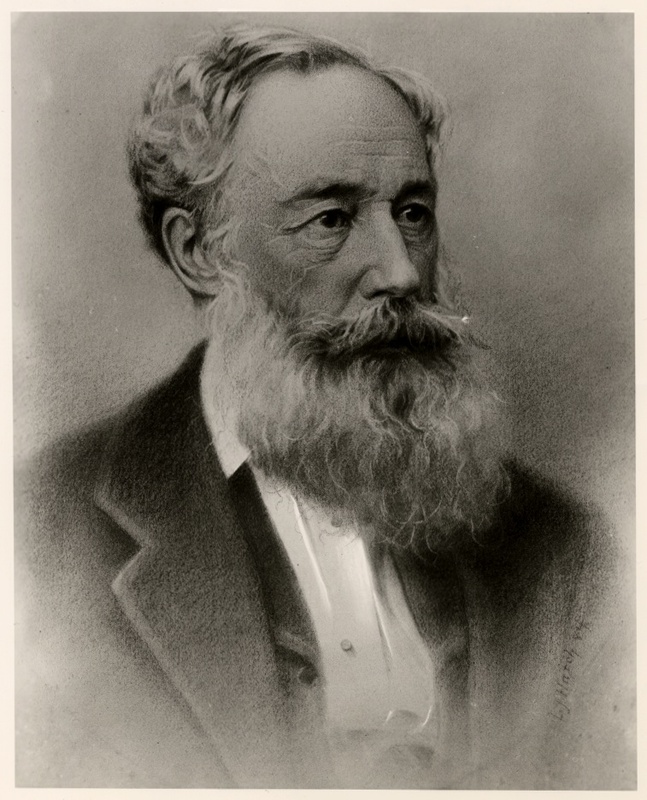 In 1851, he married his wife, Ann Patmore, in London. Hill always considered himself an artist and normally recorded himself as such on census records. However, to make ends meet, he would also work as a house painter, his father’s trade. In 1858, Hill brought his family over to America. The Hills would live in Yonkers, NY and Hoboken, NJ. Hill originally got a job with Currier and Ives as one of many nameless English artists who created the iconic prints that so captured the spirit of America. He left this job after a short while, likely unhappy with the day to day life as a menial worker. In his own paintings, Hill was very fond of painting birds. His most common images feature ducks and quails in scenic landscapes, but he also enjoyed painting farmyard scenes as well. In 1865, four of Hill’s bird paintings were exhibited at the National Academy of Design, which was a prestigious opportunity. Sadly, true success never found Hill. He continued to paint and sell his paintings to make ends meet. Hill apparently painted Assassination of Lincoln in 1872, which was a subject quite different from most of his work. Whether it was commissioned or a piece Hill completed on his own is unknown. It was owned by an American Legion Post in Albany before it was donated to the Albany Institute of History and Art in 1961. It’s ownership prior to the American Legion Post is unknown. When a financial depression began in 1873, Hill took to visiting the homes of well to do farmers, offering to paint scenes of their farm and livestock. He also used his six children to help him create an assembly line of painters. Howard and each of his children would each complete a select part of a painting allowing him to effectively mass produce paintings to sell. Though financial difficulties caused Howard to drink more, he was instrumental in teaching all of his children the art of painting. 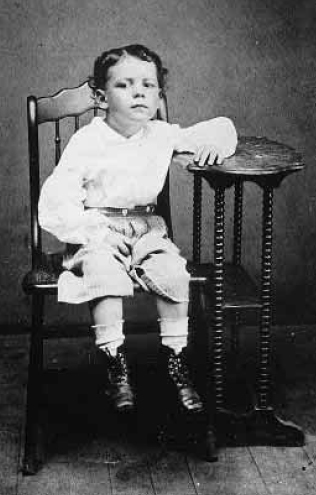 In 1886, Howard lost his wife and artist son within a span of four months. This increased his depression and for the next year he lived the life of a vagrant, moving from boardinghouse to boardinghouse and trying to get painting commissions for money. Howard Hill eventually died on March 6, 1888, likely from a stroke. He was buried in an unmarked grave next to his wife in Yonkers. Carl Bersch’s balcony is visible on the right-hand building in this drawing from Frank Leslie’s Illustrated Weekly 5/20/1865. Sadly, however, a tragic act that occurred right across the street from Bersch’s residence would put an end to the jubilant atmosphere. Bersch makes a mistake here in his letter written right after the assassination. The man who beckoned for the soldiers to bring Abraham Lincoln into the Petersen boarding house was not Willie Clark, but another boarder named Henry Safford. You can read more about Safford and about how Willie Clark was not even present at the Petersen House when Lincoln was there by clicking here. After finishing this letter to his family, Carl Bersch did complete his painting of Lincoln being carried across the street from Ford’s Theatre. The large format painting was kept by the family for many years. It was not until 1932 that Bersch’s daughter, Carrie Fischer, loaned the painting to the newly created Lincoln Museum inside of Ford’s Theatre. When the museum opened on February 12, 1932, the anniversary of Lincoln’s birthday, Bersch’s painting was publicly displayed for the first time. It is not known how long Bersch’s painting was on display at Ford’s Theatre the first time. It was a loan and therefore subject to the will of Bersch’s descendants who were still the owners. The ownership of the painting passed from Carrie Fischer to her daughter Gerda Vey, upon Carrie’s death in 1955. Then, when Gerda died in 1977, she willed the painting to the White House. The White House decided against keeping it but transferred it to the National Park Service instead where it ended back up at Ford’s Theatre. It was on display at some time during the 1980’s – 1990’s but, eventually, it was put into storage. 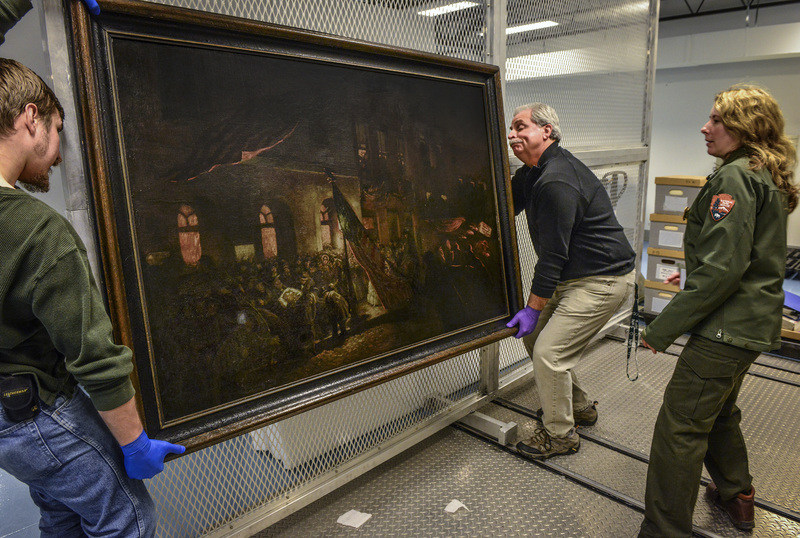 The National Park Service museum has a painting by an eyewitness of Lincoln being carried from Ford’s Theater after being shot, on April, 08, 2015 in Hyattsville, MD. Pictured, from left, Lyndon Novotny, materials handler, Bob Sonderman, Director & regional curator, and Laura Anderson, National Park Service museum curator for the National Mall. Over the many years of display the painting had accumulated dirt and grime, darkening the colors and obscuring details. 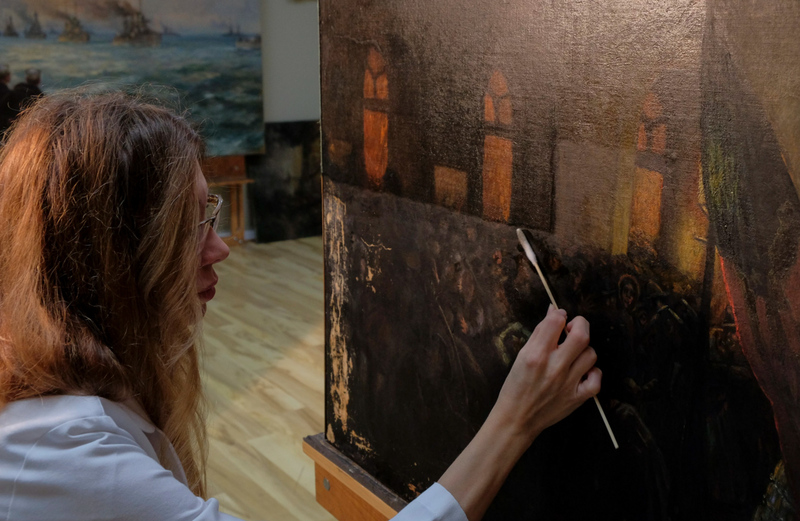 The article from October 2015, spoke of the future hope to put the painting back on display at Ford’s Theatre once the restoration of the piece was done. In the not too distant future, Carl Bersch’s “Lincoln Borne by Loving Hands” will return to the Ford’s Theatre Museum, eighty four years after its initial debut. 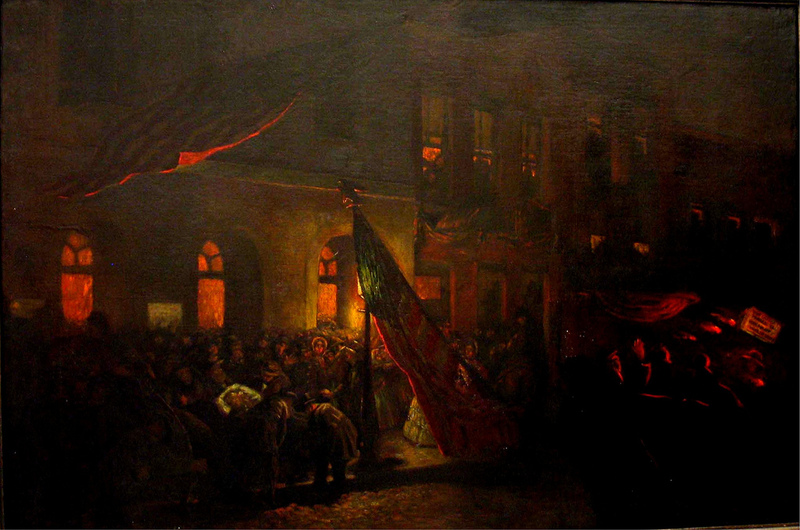 It is a unique painting from an eyewitness to the events outside of Ford’s Theatre on April 14, 1865 and deserves to a be a fixture at Ford’s Theatre once again. Carl Bersch was born on May 3, 1834 (year is disputed) in Zweibrücken, Germany which is located near the border with France. He originally studied theology at the University of Munich before taking up art. He came to America around 1861 and is said to have worked in Matthew Brady’s photography studio. He married his wife, Angelica Bode, in 1865. Together they had one child, Carrie. Bersch worked in Tennessee, Ohio, D.C., and Baltimore. He was a successful portrait artist in Baltimore and also briefly tried his hand at his own photography studio in the early 1880’s. Between artistic commissions he hired himself out as a German tutor. Bersch died on May 1, 1914 at the age of 80 and is buried with his wife, daughter, and granddaughter, in Baltimore’s Govans Presbyterian Churchyard. The biographical material on Bersch comes from his obituary in the Baltimore Sun, May 3, 1914.